The IRA Youth Challenge is an online Edutainment Essay Competition targeting students from tertiary institutions (universities, colleges, polytechnics) across the Kenya. We want you to be young and insured….. How cool is that! The IRA (Insurance Regulatory Authority) is keen on attracting and empowering the youth given that the youth are the future buyers of insurance and are critical in enabling the industry attain a higher insurance penetration. Experience has shown that the youth have a different way of understanding and appreciating any form of education or awareness programs when compared with adults. Most of the awareness programs undertaken by IRA in the past have been targeting the adult population thus leaving out the youth. These programs are referred to as Information, Education and Communication (IEC) materials. These include booklets, brochures, display panels and Braille material, among others. The youth are generally not keen on the detailed wordings used in IEC materials unless they read them for academic purpose. 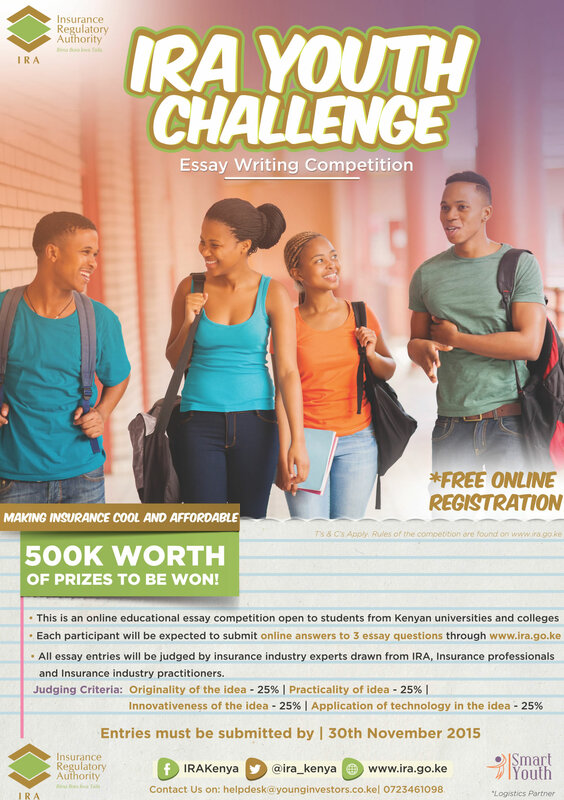 To attract the attention of the youth towards insurance through a competitive insurance essay writing competition. In the process of the competition, the youth will seek and acquire more information about insurance. Improve insurance literacy amongst the youth. Open up to and integrate the youth into the insurance sector, not only as buyers but also as players. Facilitate the development of suitable insurance products for youth. 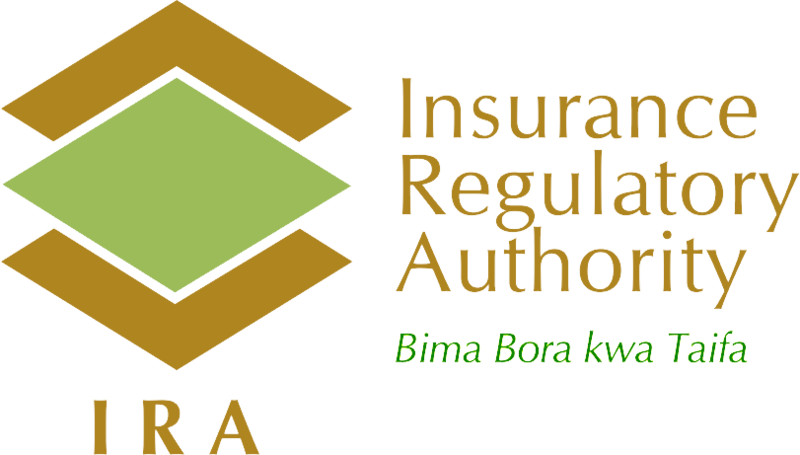 The Insurance Regulatory Authority (IRA) is a state agency charged with regulating supervising and developing the insurance industry in Kenya. Given the way insurance was introduced into the country and the way the business has been conducted over the years, most Kenyans have developed negative attitude towards insurance making insurance penetration considerably low compared to other financial service sectors. It is the responsibility of the Authority to enhance growth, stability, create confidence and improve people’s perception towards insurance. The Authority can only achieve this objective by creating awareness about the needs and benefits of insurance among Kenyans. In a bid to achieve this objective, the Authority, in 2011 established Consumer Education Section within Policy Research and Development (PRD) division to develop and execute consumer education programs. The Consumer Education Section is charged with creating awareness about the role of IRA and the steps the Authority has taken to streamline the industry as well as sensitizing Kenyans about the needs and benefits of insurance. The youth in Kenya comprise over 60% of the economically active population. The Government, under the new constitution has laid emphasis on many youth development programs. The youth are IT savvy, putting them in top priority in the Government’s drive to automate its operations. Most of our current leaders, both within and outside parliament are comprised of the youth, further amplifying their continued dominance of economic, political and social spheres in Kenya. In 2013, Kenya joined the ranks of the world’s middle-income economies after a statistical reassessment of its economy increased the size of its GDP by 25.3 per cent. Kenya, therefore, becomes Africa’s ninth largest economy. The implication of rebasing is the pushing up of a sizeable proportion of Kenyans up the middle income threshold by the same 25.3% GDP increase. These new middle income groups require insurance to protect their hard earned wealth from risks as well as secure the future of their families should something untoward happen to their lives. National Microfinance Bank Plc (NMB) is one of the largest commercial banks in Tanzania, providing banking services to individuals, small to medium sized corporate clients, as well as large businesses. It was established under the National Microfinance Bank Limited Incorporation Act of 1997, following the break-up of the old National Bank of Commerce, by an Act of parliament .Three new entities were created at the time, namely: NBC Holding Limited, National Bank of Commerce (1997) Limited and National Microfinance Bank Limited. Initially NMB could only provide payment services as well as offer savings account, with limited lending capabilities, before becoming a fully-fledged universal retail bank. Subsequently, there was further divestiture in 2008 when the Tanzanian Government off loaded another 21% of its shareholding to the Tanzanian public through an initial Public Offering(IPO).The listing of the bank's stock on the Dar es Salaam Stock Exchange has led to a diversified ownership structure.